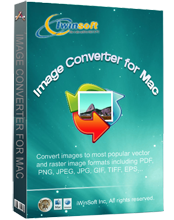 You can use iWinSoft Image Converter application to view the image files on Mac, and convert them to most popular image formats including PDF, PNG, JPEG, GIF, TIFF, EPS, PICT, BMP and SGI. You can navigate throught the images in a folder using navigation keys and keyboard shortcuts. Changing the view size allows to view at different zoom amounts. Also you have ability to rotate selected Image file. To choose Image file just drag it into main window. To convert a file you need to click the Convert button. Choose one of the export formats, and the export resolution in the Preferences Drawer. You may also set the destination folder and filename. Selecting Same Destination location will create the converted file at the same location as the original one.